This weekend's scheduled start of the Serie A season in Italy will be delayed because of a strike by players. The players' union (AIC) and the clubs' union (Lega) are disputing a collective bargaining agreement after the previous deal expired at the end of last season. "We tried right up until the end, but all the attempts were in vain," said the Italian players' association president Damiano Tommasi. The clubs earlier rejected an Italian FA proposal to resolve the matter. The AIC is unhappy about clubs trying to force players to move in the last year of their contracts. And the clubs are also unhappy because they want players to pay a new tax that applies to high earners imposed by the Italian government as part of austerity measures. 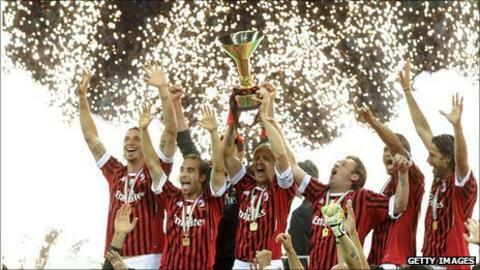 The new season was due to start on Saturday with Siena hosting Fiorentina and titleholders AC Milan visiting Cagliari. Siena and Cagliari were the only two of the 20 Serie A clubs to vote in favour of the players' proposal on Wednesday. Tommasi offered on Friday for the league to sign a temporary contract until June 2012 - without the two additional clauses the clubs want - saying that otherwise "it could take months, not 15 days" to resolve the conflict. With a break for international matches over the weekend of 3-4 September, the strike could delay the start of the season until 10 September. The dispute has rumbled on since the end of the 2009-10 season season when a previous agreement expired, but strikes were twice averted at the last minute last year. The only other players' strike in Serie A history was in March 1996.